SCVHistory.com LW2865 | Film-Arts | Buck Jones in 'One Man Law,' Placerita Canyon 1932. 11x14-inch lobby card features a colorized (painted) BW publicity still that was shot inside the Walker family's tiny winter cabin. (It's posed, not a frame of movie film.) The cabin still stands adjacent to the parking lot at the present-day Placerita Canyon Nature Center. 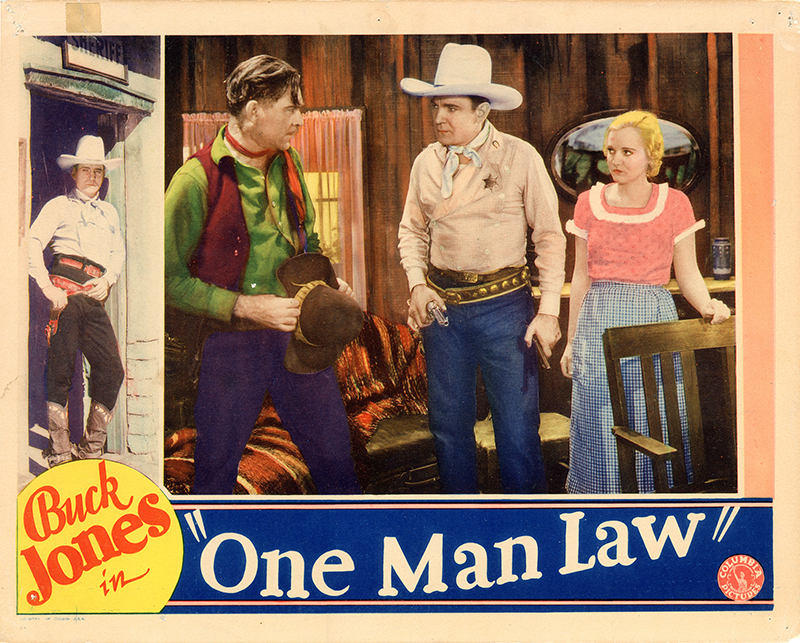 Written and directed by Lambert Hillyer (who also directed William S. Hart on several occasions), "One Man Law" was initially released Jan. 11, 1932, and exists today on DVD. Jonathan Streeter (Robert Ellis), a crooked land promoter in Ropersville, helps cowpuncher Brand Thompson (Buck Jones) become sheriff of the town. Brand's sweetheart, Grace Duncan (Shirley Grey), and many other settlers have been living on and improving farms and ranches they bought from Streeter, but without receiving land titles. Then, a number of families from Chicago arrive in town with titles to the land occupied by Grace and the other settlers. Streeter has flown to coop; Sheriff Thompson is compelled to declare the newcomers are the legal owners, and then he must find a way to settle the disputes to the satisfaction of all parties. "One Man Law" also features Murdock MacQuarrie,	Harry Todd, Henry Sedley, Ernie Adams and Richard Alexander. Uncredited cast: Tom Bay, Milton Brown, Roy Bucko, Bob Burns, Fred Burns, Jim Corey, Jack Curtis, Frank Ellis, Bob Fleming, Wesley Giraud,	Tiny Jones, Edward LeSaint, Tom London, Lew Meehan, Buck Moulton,	Tex Phelps, Albert J. Smith, Blackjack Ward, Slim Whitaker and Blackie Whiteford. About Buck Jones: A Tragic End. LW2865: 9600 dpi jpeg from original lobby card purchased 2017 by Leon Worden.